The sport of Candlepins is a bowling game unique to New England and the Canadian Maritime Provinces. First played in Worcester Massachusetts in 1880, Candlepin Bowling is an exciting skillful sport, requiring minimal physical strength while demanding great timing, dexterity and patience from each participant. Candlepin bowling is enjoyed by the young and old, the strong and the handicapped, by boys and girls, men and women. It is indeed a sport for all people. That is what prompted the formation of the International Candlepin Bowling Association. The I.C.B.A. is an umbrella organization that consists of delegates from each State and Provincial Association. 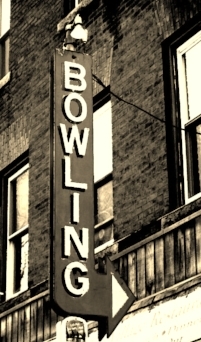 Its members see Candlepin Bowling as a part of history and wish to insure its future. One of the goals of the I.C.B.A. is to unify the sport so that Candlepin Bowlers will be bowling under the same conditions and rules no matter where they bowl. This site contains the official Candlepin rules as of July 2002. The New Hampshire Candlepin Bowling Association sponsored a “Think Tank” seminar to discuss the state of the Candlepin bowling industry. Bob Parrella made a presentation entitled “Duckpin bowling reorganization as compared to Candlepin bowling”. This presentation discussed the need to create a unifying association to replace the defunct “World Council” that was the former umbrella organization of Candlepin bowling. At the Candlepin bowling convention held at Cape Cod, Massachusetts a presentation regarding the need to form an umbrella organization representing all States and Provinces where Candlepin bowling was played was held. It was decided that a committee should be formed to investigate the formation of a joint organization representing all Candlepin bowling. Royal Edgerly, Jr., proprietor of Bowlaway Lanes in Rochester, N.H. chaired the committee. A survey to ascertain the ideas and needs of bowling proprietors was distributed to all proprietors at the convention. The first meeting of the committee formed to investigate the forming of an umbrella organization for Candlepin bowling was held. Approval by all MA, NH, ME, NB, and NS was given. Chris Anton of Scarboro, ME presented a draft of by–laws for this new organization named the “International Candlepin Bowling Association and they were approved.